When is a flat tire a little more than just an inconvenience? When its a sign! Tires are made of rubber and filled with air, they are the part of your vehicle that touches the ground. What you have then is a symbol of your belief systems and what reality you are anchored in. 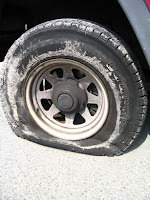 A flat tire is a symbol that although you may have the right idea and be on the right track, your energy level might be too low to fully invest emotionally in the project. You are losing your enthusiasm, and its time to examine the reasons why you are not where you feel you should be. If it is a slow leak, as in a nail hole or puncture, you have a person, situation, or another energy drain, a problem that robs you of your emotions and thoughts, creeping in when you are still. And for whatever reason, you may feel powerless to change this situation. The real problem is not the situation, the problem is in your belief system. If you are uncertain what your negative beLIEf may be, notice the judgements you hold against yourself or others. If you are envious of another, there is evidence in your emotional body that you have a block up in that area. This means that any effort to achieve what you envy will be inevitably sabotaged. So this is a good place to start! If you have just remedied a flat tire, your ability to bounce back after adversity is going to prove valuable in the weeks to come. A sudden flat tire is an urgent message from the Universe to not be too hasty in moving ahead with your plans. Get there emotionally first, have a clear vision and then and only then, move forward. If you are frustrated by your outer progress, or lack thereof, return to your vision. A vision has no fuel without emotion, so if you are not emotionally invested in the vision, it will...ahem...fall flat.